Only just a little over 7000 were in attendance to witness it in flesh, but Bengaluru FC entered their names in the Indian football history books when they became the first club to win both the I-League and Indian Super League titles. 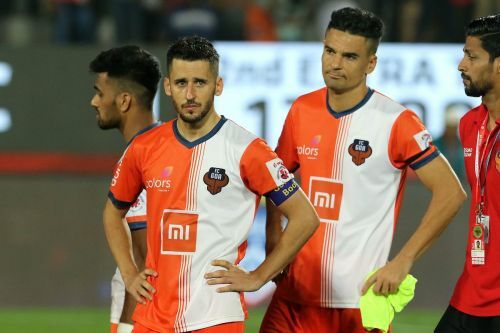 After losing the final to southern rivals Chennaiyin FC in their debut campaign in the competition, Carles Cuadrat’s men pulled off what Albert Roca’s team couldn’t pull off last season. They defeated FC Goa 1-0 at the Mumbai Football Arena on Sunday night in front of a boisterous crowd to lift the coveted trophy. Neither side played the attractive brand of they have been known for, but the game did have huge moments, from novice defender Saviour Gama replacing injured Mandar Rao Dessai and both teams entering a scuffle following a red-card incident. Much like most other finals, drama was aplenty in this game, and here are five talking points from Bengaluru’s monumental win over FC Goa. The teams uncharacteristically played a physical game as they committed far more fouls than they’ve been seen doing through the season. Players could be seen falling to the ground clutching their legs at regular intervals. As a result, either side’s attack lacked punch. Hardly did they manage to find a rhythm. While the travelling Bengaluru FC and FC Goa fans created a vibrant atmosphere, fans online labelled the first 90 minutes “boring” and grieved over the fact that Goa and Bengaluru, known for their attacking brand of football, proved shadows of their league-stage selves. There, indeed, were moments when the attackers, including Jackichand Singh, Udanta Singh, Edu Bedia, Brandon Fernandes, Ferran Corominas and Miku, appeared to break down defences. However, they fell prey to the opposition’s offside trap more often than not. While the attackers failed to create any impact, the defenders, including Nishu Kumar, Juanan and Mourtada Fall all impressed heavily.